After serving 5 years on the Board of Directors, John was appointed Executive VP and Chief Operating Officer for the California Community Foundation (CCF) in 2008. Founded in 1915, CCF is the 60th largest foundation in the nation with more than $1.4 billion in assets. CCF is focused on creating equitable opportunities for LA County’s most vulnerable residents as well as assisting high net worth families pursue their philanthropic visions. Since 2003, CCF has raised more than $2.0 billion and distributed more than $1.8 billion in grants to non-profits and charities in Los Angeles and beyond. For nearly forty years, John has been leading and managing diverse and complex non-profit and for-profit organizations. John was engaged in three pioneering start-ups traversing education and entertainment. He regards himself as a social entrepreneur who specializes in building successful and growing organizations through change management, innovation and a focus on social outcomes. Prior to his appointment at CCF, John was CEO of the CK12 Foundation, a nonprofit technology startup that provides no-cost textbooks to the K-12 market. He was the founding President of OnlineLearning.net, one of the earliest start-ups of online continuing higher education. He also served as President/CEO of Big Brothers Big Sisters of Greater Los Angeles, Senior VP of Online Higher Education for Sylvan Learning Systems Inc, Vice Chancellor of External Affairs at UCLA, and Executive Director of the UCLA Alumni Association. John has been involved in education, social justice, and philanthropy for his entire life. He has held leadership positions at a wide variety of regional, national, and international non-profit organizations in the arts, education, and philanthropy. 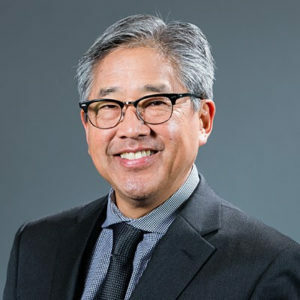 John currently serves on the boards of the MLK Community Hospital Foundation, Japanese American National Museum, LA Kitchen, SCGA Foundation and Walden University. John received the Southern California Grantmakers Joint Affinity Group Leadership Award in 2014. In 2011, the US Pan Asian Pacific Chamber of Commerce honored him with their Trailblazer Award. In 2010, he was recognized for distinguished public service with the Coro of Southern California Crystal Eagle. And in 2007, Los Angeles Mayor Antonio Villaraigosa gave John the City of Angels award for his service on behalf of children and families. John was a Coro Fellow in LA and earned degrees from UCLA, USC, and Occidental College.